For other people named Joseph Warren, see Joseph Warren (disambiguation). Joseph Warren (June 11, 1741 – June 17, 1775) was an American physician who played a leading role in American Patriot organizations in Boston in the early days of the American Revolution, eventually serving as President of the revolutionary Massachusetts Provincial Congress. 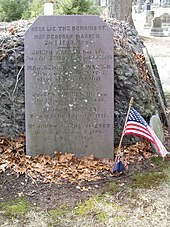 Warren enlisted Paul Revere and William Dawes on April 18, 1775, to leave Boston and spread the alarm that the British garrison in Boston was setting out to raid the town of Concord and arrest rebel leaders John Hancock and Samuel Adams. 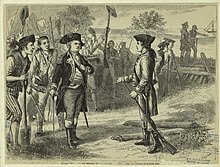 Warren participated in the next day's Battles of Lexington and Concord, which are commonly considered to be the opening engagements of the American Revolutionary War. Warren had been commissioned a Major General in the colony's militia shortly before the June 17, 1775 Battle of Bunker Hill. Rather than exercising his rank, Warren served in the battle as a private soldier, and was killed in combat when British troops stormed the redoubt atop Breed's Hill. His death, immortalized in John Trumbull's painting, The Death of General Warren at the Battle of Bunker's Hill, June 17, 1775, galvanized the rebel forces. He has been memorialized in the naming of many towns, counties and other locations in the United States, by statues, and in numerous other ways. Joseph Warren was born in Roxbury, Province of Massachusetts Bay, to Joseph Warren and Mary (Stevens) Warren. His father was a respected farmer who died in October 1755 when he fell off a ladder while gathering fruit in his orchard. After attending the Roxbury Latin School, Joseph enrolled in Harvard College, graduating in 1759, and then taught for about a year at Roxbury Latin. He studied medicine and married 18-year-old heiress Elizabeth Hooten on September 6, 1764. She died in 1772, leaving him with four children: Elizabeth, Joseph, Mary, and Richard. Before his death in 1775 he was engaged to Mercy Scollay. While practicing medicine and surgery in Boston, he joined the Masonic Lodge of St. Andrew, which had received a warrant from the Grand Lodge of Scotland in 1756. He was Master of the Lodge in 1769 at the same time that Paul Revere was its Secretary. Warren was appointed Grand Master of the newly established Provincial Grand Lodge of Massachusetts in that same year. (Upon his death, John Hancock became Grand Master.) He also became involved in politics, associating with John Hancock, Samuel Adams, and other leaders of the broad movement labeled Sons of Liberty. Warren conducted an autopsy on the body of young Christopher Seider in February 1770, and was a member of the Boston committee that assembled a report on the following month's Boston Massacre. Earlier, in 1768, Royal officials tried to place his publishers Edes and Gill on trial for an incendiary newspaper essay Warren wrote under the pseudonym A True Patriot, but no local jury would indict them. In 1774, he authored a song, "Free America", which was published in colonial newspapers. The poem was set to a traditional British tune, "The British Grenadiers." Joseph Warren joined the Scottish Rite Freemasonry, being initiated in the St. Andrew's Lodge (Boston, MA), and later becoming Past Provincial Grand Master of Massachusetts. As Boston's conflict with the royal government came to a head in 1773–75, Warren was appointed to the Boston Committee of Correspondence. He twice delivered orations in commemoration of the Massacre, the second time in March 1775 while the town was occupied by army troops. Warren drafted the Suffolk Resolves, which were endorsed by the Continental Congress, to advocate resistance to Parliament's Coercive Acts, which were otherwise known as the Intolerable Acts. He was appointed President of the Massachusetts Provincial Congress, the highest position in the revolutionary government. Warren slipped out of Boston early on April 19, and during that day's Battle of Lexington and Concord, he coordinated and led militia into the fight alongside William Heath as the British Army returned to Boston. When the enemy were returning from Concord, he was among the foremost in hanging upon their rear and assailing their flanks. During this fighting Warren was nearly killed, a musket ball striking part of his wig. When his mother saw him after the battle and heard of his escape, she entreated him with tears again not to risk life so precious. "Where danger is, dear mother," he answered, "there must your son be. Now is no time for any of America's children to shrink from any hazard. I will set her free or die." He then turned to recruiting and organizing soldiers for the Siege of Boston, promulgating the Patriots' version of events, and negotiating with Gen. Gage in his role as head of the Provincial Congress. Warren was commissioned as a major general by the Provincial Congress on June 14, 1775. Several days later, in the moments before the Battle of Bunker Hill, Warren arrived where the militia was forming and asked where the heaviest fighting would be; General Israel Putnam pointed to Breed's Hill. Warren volunteered to join the fighting as a private against the wishes of General Putnam and Colonel William Prescott, both of whom requested that he serve as their commander. Warren declined the command in the belief that Putnam and Prescott were more experienced with war. He was among those inspiring the men to hold rank against superior numbers. Warren was known to have repeatedly declared of the British: "These fellows say we won't fight! By Heaven, I hope I shall die up to my knees in blood!" He fought in the redoubt until out of ammunition and remained until the British made their third and final assault on the hill to give time for the militia to escape. He was killed instantly by a musket ball in the head by a British officer (possibly Lieutenant Lord Rawdon) who recognized him. This account is supported by a 2011 forensic analysis. His body was stripped of clothing and he was bayoneted until unrecognizable, and then shoved into a shallow ditch. British Captain Walter Laurie, who had been defeated at Old North Bridge, later said he "stuffed the scoundrel with another rebel into one hole, and there he and his seditious principles may remain." In a letter to John Adams, Benjamin Hichborn describes the damage that British Lieutenant James Drew, of the sloop Scorpion, inflicted on Warren's body two days after the Battle of Bunker Hill: "In a day or two after, Drew went upon the Hill again opened the dirt that was thrown over Doctor: Warren, spit in his face jumped on his stomach and at last cut off his head and committed every act of violence upon his body." His body was exhumed ten months after his death by his brothers and Paul Revere, who identified the remains by the artificial tooth he had placed in the jaw. His body was placed in the Granary Burying Ground and later (in 1825) in St. Paul's Church before finally being moved in 1855 to his family's vault in Forest Hills Cemetery. General Gage reportedly said Warren's death was equal to the death of 500 men. It encouraged the revolutionary cause because it was viewed by many Americans as an act of martyrdom. At the time of Warren's death, his children were staying with his fiancée, Mercy Scollay, in Worcester as refugees from the Siege of Boston. She continued to look after them, gathering support for their education from John Hancock, Samuel Adams, Mercy Otis Warren, Benedict Arnold, and even the Continental Congress. Joseph's youngest brother and apprentice in medicine, John Warren, served as a surgeon during the Battle of Bunker Hill and the rest of the war, and afterwards founded Harvard Medical School and co-founded the Massachusetts Medical Society. Josiah Warren, inventor, musician, individualist anarchist and author in the United States, was a grandson of Joseph Warren. There are at least four statues of Joseph Warren on public display. Three are in Boston — one in the exhibit lodge adjacent to the Bunker Hill Monument, one is on the grounds of the Roxbury Latin School and one is atop the pudding-stone at his grave site at the Forest Hills Cemetery (this statue was commissioned by the 6th Masonic District, and dedicated in a ceremony by the Grand Master of Masons in Massachusetts on October 22, 2016). The fourth is in a small park on the corner of Third and Pennsylvania avenues in Warren, Pennsylvania, a city, borough, and county all named after the general. Fort Warren on George's Island in Boston harbor, started in 1833, was named in his honor. In 1840, the first Warren School was built on Salem Street in Charlestown, Massachusetts near Bunker Hill. It relocated to School and Summer Streets in 1868, and later merged with the Prescott School to form the Warren-Prescott School. Fourteen states have a Warren County (list) named after him. Additionally, Warren, Pennsylvania; Warren, Michigan; Warren, New Jersey; Warrenton, Missouri; Warrenton, Virginia; Warren, Maine; Warren, Massachusetts; Warrenton, North Carolina; Warren, Connecticut and 30 Warren Townships are also named in his honor. The New York county of Warren is named after him, but the town of Warrensburg within that county is not; the town is in fact named after James Warren, a prominent early settler. The streets of Detroit, Michigan, were redesigned after the 1806 fire, based on the Pierre L'Enfant Plan for Washington, D.C.; Warren Avenue in Detroit is named after Joseph Warren. Five ships in the Continental Navy and United States Navy were named Warren in his honor. The Grand Lodge of Massachusetts has an award in his name for Masons who have served the fraternity, the country, or humanity with distinction. It is the second-highest honor conferred by the Grand Lodge, only surpassed by the Henry Price medal. The Henry Price medal is usually awarded to those who served with distinction in the Grand Lodge, while the Joseph Warren medal may be conferred upon any Mason within the Grand jurisdiction. Walter Coy portrayed Dr. Warren in the 1957 film Johnny Tremain. Warren also appeared in episodes 5 and 9 of the 2002 animated television show Liberty's Kids. Ryan Eggold was cast as Warren in the 2015 miniseries Sons of Liberty. Dr. Warren is featured in the song "Wildfire" by the band Mandolin Orange on their 2016 album Blindfaller. ^ Frothingham 1865, pp. 12–13. The book's description of "the grammar school in Roxbury" appears to indicate Roxbury Latin School. ^ Frothingham 1865, p. 558. ^ "15 MAY 1769 - BOSTON, MASSACHUSETTS... - The Grand Lodge of Antient Free and Accepted Masons of Scotland - Facebook". Retrieved 14 May 2016. ^ "The Builder Magazine - October 1918". Retrieved 14 May 2016. 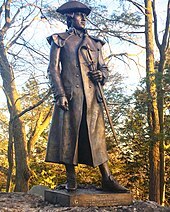 ^ "Joseph Warren, Martyr of Bunker Hill". Retrieved 25 August 2015. ^ Forman 2012, Chapter 10. ^ Silverman, Jerry. "Of Thee I Sing," Citadel Press, 2002, p. 3. ^ "U.S. Famous Master Mason". Archived from the original on Jan 4, 2016. ^ Fischer 1994, p. 95–97. 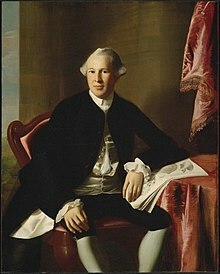 ^ Journal of the American Revolution: "Dr. Joseph Warren's Informant" (April 3, 2014) https://allthingsliberty.com/2014/04/dr-joseph-warrens-informant/. ^ Tourtellot 1959, p. 213. ^ "To John Adams from Benjamin Hichborn, 25 November 1775". National Archives. Retrieved 1 August 2014. ^ "Full Historic Timeline". Charlestown Historical Society. Retrieved 25 August 2015. ^ Dyson, Cathy (July 20, 2003). "History and legend unlock origins of unusual names". The Free Lance-Star. pp. A7. Retrieved 3 May 2015. ^ Smith, H.P. (1885). History of Warren County. Syracuse, N.Y.: D. Masons & Co. p. 575. ^ "The Streets of Detroit". Tina Granzo. Retrieved 25 August 2015. Cary, John (1961) Joseph Warren: Physician, Politician, Patriot. University of Illinois Press. Fischer, David Hackett (1994). Paul Revere's Ride. Oxford University Press. Frothingham, Richard (1865). Life and Times of Joseph Warren. Boston: Little, Brown, & Company. Wilson, James Grant; John Fiske, editors. 1887–1889. Appleton's Cyclopedia of American Biography, Six volumes, New York: D. Appleton and Company. Wikimedia Commons has media related to Joseph Warren. 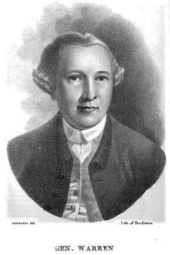 Dr. Joseph Warren on the Web Comprehensive compendium of searchable full texts of Joseph Warren's writings and speeches, with weekly updates. THE BROKERAGE ROLE IN THE MAKING OF THE AMERICAN REVOLUTION Social Network Analysis using only organizational affiliations identifying Joseph Warren and Paul Revere as central to the events leading up to the American Revolution.